For more than 30 years, Phyllis Helgeson has been volunteering at Mayo Clinic, going above and beyond to connect with patients and help wherever she's needed. Throughout the course of their marriage, Phyllis Helgeson worked hand in hand with her husband on their farm near the Minnesota-Iowa border. "I milked and fed cows, fed chickens, fed horses, put up and mended fences, drove tractors, mowed the lawn and did just about anything else you can think of," Phyllis tells us. With one exception. "I've never driven a combine. That's the only thing I didn't do around the farm." So it's easy to understand that after Phyllis's husband passed away in 1986, she was admittedly "a bit lost." And why, after taking time to mourn and grieve her loss, Phyllis decided to get right back in the saddle, so to speak. "I needed to do something, so I started volunteering," Phyllis tells us. Wanting "to put some distance between myself and the farm," she bypassed a Mayo Clinic Health System site near her home and instead drove herself 45 miles to Mayo Clinic's Rochester campus. Phyllis tells us she's still a little surprised she even got an interview when she arrived. "When I filled out the application, I was supposed to give the names of three volunteers who could vouch for my own ability to volunteer," she says. "I didn't know a single soul in Rochester at the time, let alone anyone who volunteered at Mayo Clinic." After talking with Phyllis, however, Mayo's volunteer coordinator at the time decided to look past that. "I guess they were desperate so they let me in," Phyllis says with a chuckle. 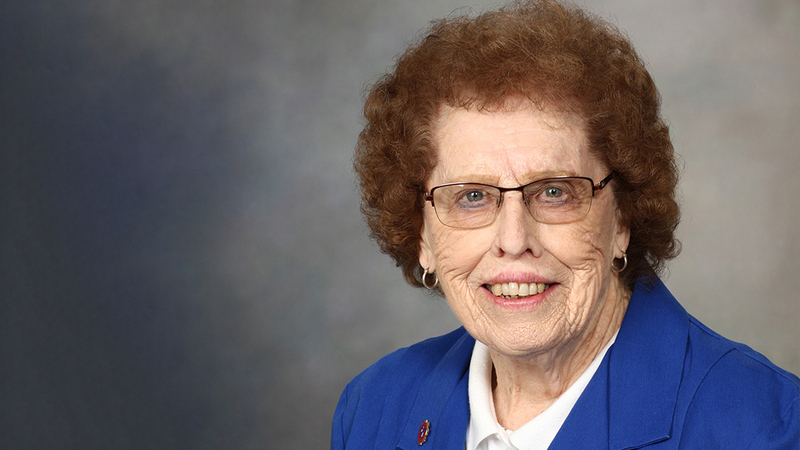 Lisa Brink, Mayo's current volunteer manager at Mayo Clinic Hospital, Saint Marys Campus, tells us Phyllis brought her industrious spirit to her illustrious 30-plus-year volunteering career at Mayo Clinic. "It's probably easier for me to tell you the things she hasn't done," Brink says. "She's almost 94 years old now, and she still drives herself to Rochester every other week to volunteer. She does three and a half hours every other Thursday as a surgical messenger and then another four hours in the Emergency Department." Along the way, Phyllis served two terms as president of the Saint Marys Volunteer Council and served on Mayo's Heritage Days Committee. And this past summer, when Mayo converted to its new electronic medical record, "she came in and learned how to use pieces of that to help her better connect patients with their families in her role as a surgical messenger and volunteer in the ER." And for the past three decades, Phyllis tells us that's what it's all been about: helping others. "We volunteers are very loyal to everything Mayo believes in," she says. "It's very interesting and rewarding work that's just become a part of my life." For that, Brink, at the very least, is thankful. "Like our other volunteers, what makes Phyllis so special is her ability to go with the flow and treat any unexpected difficulties or challenges as learning opportunities," Brink says. "That's both refreshing and a blessing." You can refresh and bless us by sharing your comments below before using the handy social media tools atop this page to share this story with others. Read more about Mayo Clinic Volunteer Services. Thank you, Phyllis, for all you do!